At ColleZione, we don't normally "do" cherubs but for this fine example we made a rare exception. The Putti Vase is appealing because of its guileless display of naked cherubs and its modern rendering of classic Italian beatific style. 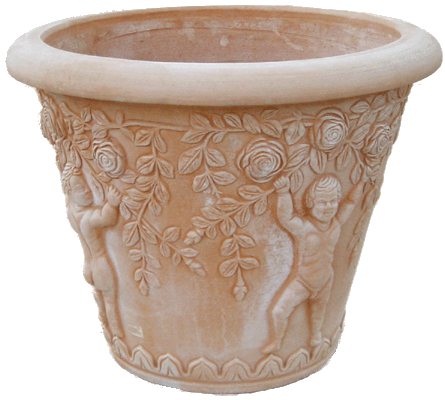 An ample piece, it can easily accommodate a dwarf citrus or large shrub. Made of Impruneta clay. Call, email or fax for prices. Crated and shipped via common carrier.